Ernestina Ledermann was born on the 1st of February 1912 as an illegitimate daughter of the teacher Margarethe Ledermann and the Chilean officer Ernesto Gallardo in Berlin. Her mother derived from a Jewish lineage, but converted to a Protestant religion afterwards. Ernestina took private lessons between 1920 and 1928. Additionally, she studied at doctor Thie’s. Afterwards, Ernestina attended vocal teaching at Ylira Helberg, a Swedish minstrel. 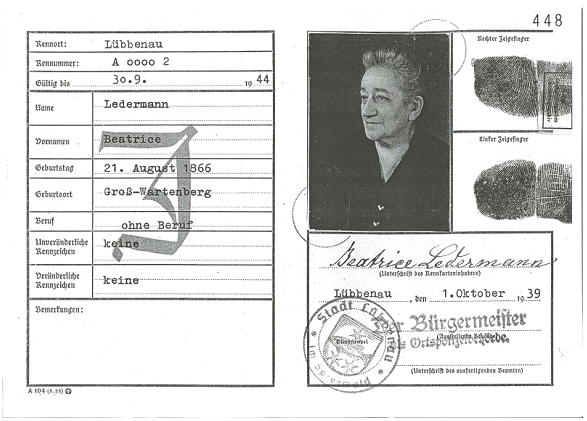 Ernestina Ledermann changed her surname with permission of the Prussian Department of Interior to Gallardo in 1927. She started her career as a singer in the “Dschungel-Bar” in 1932/1933. Within the same timeperiod she took vocal lessons at Silvia Laval Jaffé. At the age of 23, in 1935, she engaged with Gerhard Raffalovich, who left her immediately after the signing of the “Nürnberger Gesetze”. Due to her half-Jewish heritage, she was not allowed to work at the “Schillertheater” in Berlin. Ernestina Gallardo had her last permission to act and sing from the “Reichstheaterkammer”. The “Reichstheaterkammer” assumed that she was Spanish. 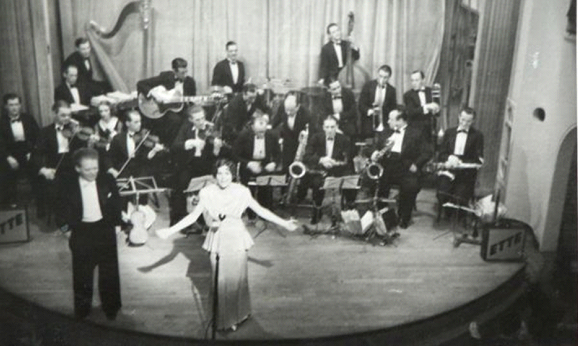 She toured with the orchestra starring Bernhard Etté through Germany. At the same time a policeman from Berlin was able to provide Aryan passports to her mother Margarethe and her aunt Melanie with the intent to disguise them as Christians. During the reign of the Nazis, Ernestina Gallardo visited her aunts Anna and Beatrice Ledermann in the 34th mainstreet in Lübbenau and served them with food supplies. Then her aunt Anna died in 1937. 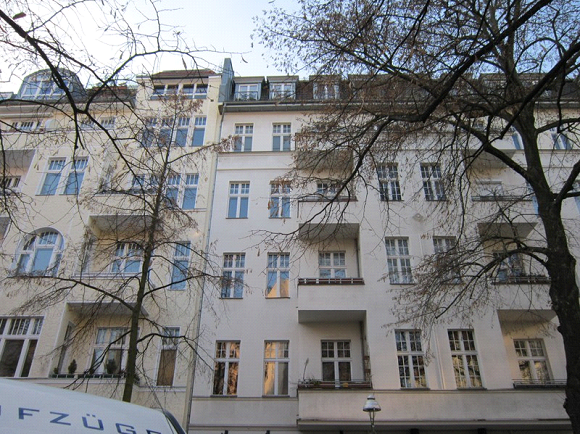 In the timeperiod from 1940 to 1945 Ernestina supported people persecuted by the Nazi regime in her own personal apartment in the Markgraf-Albrecht-Straße 8. 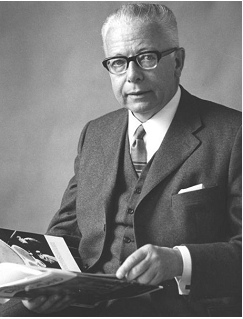 Known examples are Dr. Alfred Karpen, a Jewish lawyer and Helene Erb, who was known in Berlin as a Jewish modiste. In 1940 the property of her aunt in Lübbenau should have been transfered to, but the Nazis confiscated this property before they could put the plan into action. In 1941 the Nazis began to deport the Jewish population to extermination camps. In autumn of the following year her aunt Beatrice Ledermann should have been deported, too. But the first deportation attempt was canceled due to her poor state of health. As a result of the announcement of a second deportation, her aunt killed herself on the 19th of November 1942. After the assassination attempt of the 20th of July 1944 Ernestinas phone number was found at the arrested Dr. Erich Gloeden, which was the reason why she fled to Petershagen. Her mother Margarethe Ledermann and her aunt Melanie Ledermann tragically died after a devastating illness in 1945. After the German capitulation, in the time from 1945 to 1949, Ernestina tried to establish herself professionally through multiple smaller performances in Berlin bars and through engagements as a film artist. But because of her sanitary complications, she was not able to gain a foothold in her former profession. After requesting reparation because of damage to her wealth and profession on the 29th of October 1952, she earned 8.600 DM. 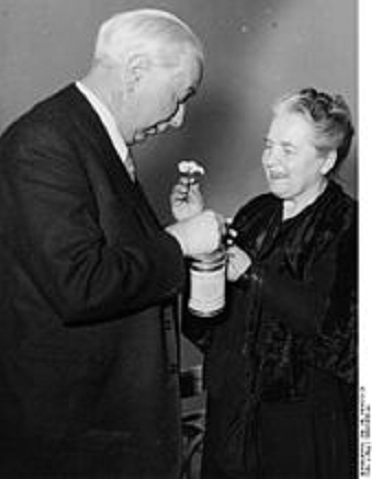 In 1960 it was made public that she assisted Helene Erb in 1943, which resulted in her being honored by the Berlin senate as an “unbesungene Heldin” on the 8th of November 1962. Shortly after her honor, she requested acknowledgement as a victim of political and racial persecution by the Nazis (short PrV), which was rejected by the compensation office in Berlin. In the following years, she had to receive medical treatment because of her bad sanitary condition. In the August of 1969, it was judged that her request for acknowledgement as a victim of political and racial persecution and the resulting lawsuit were rejected. The district court in Berlin honored her for her resistance, but rejected the lawsuit, because the compensation office reasoned that she has not received any sanitary complications due to her engagement in the resistance. Three years later the acting federal president Gustav Heinemann invited her to an honorary event in the castle Bellevue on the 14th of October 1972, for the individuals who provided selfless support for those, who were persecuted by the NS-regime. She accepted the invitation. In the following years she attempted various cures, which were financed by the office of compensation. She had an implantation of a cardiac pacemaker in the Sankt-Gerhard-Hospital in September of 1982. Unfortunately, the costs were not refunded. Ernestina Gallardo committed suicide on the 20th of June 1982. 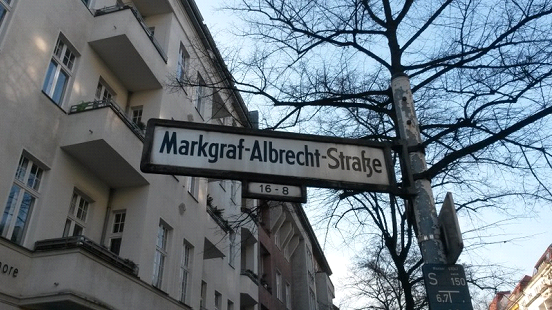 She threw herself out of her apartment on the fourth floor at the corner of the Markgraf-Albrecht-Straße and Damaschkestraße in Berlin. On her table was a cash box with approximately 4000 Mark, saving books and gold coins.